CNN's Brooke Baldwin interviewed Mark Benjamin of Time Magazine about his recent article on the Arlington Cemetery mix-up. POPLAR, Mont. 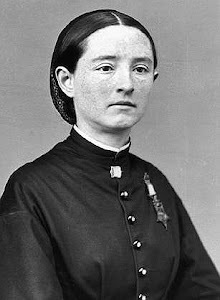 -- Chelle Rose Follette fashioned a noose with her pajamas, tying one end to a closet rod and the other around her neck. When her mother entered the bedroom to put away laundry, she found the 13-year-old hanging. Ida Follette screamed for her husband, Darrell. He lifted his child's body, rushed her to the bed and tried to bring her back. "She was so light, she was so light. And I put her down. I said, 'No, Chelle!'" But the time had passed for CPR, he said, his voice fading with still raw grief. His wife sat next to him on the couch, sobbing at the retelling. Here on the Fort Peck Indian Reservation, a spasm of youth suicides had caused alarm and confusion even before Chelle's death.The Follettes had talked with her about other local children who had killed themselves. She had assured her parents that they need not worry about her. When they deploy, they think they know all the risks. They know they can be killed. They know they can end up seriously wounded. They are aware there is a stress on their spouse while they are gone. To use this as an excuse for the growing number of suicides, simply does not make sense. Why? Because too many young service members have taken their own lives without being connected to a spouse. What they all have in common is they were deployed and survived, but when they were supposed to be out of danger, they were really in greater danger. They were unarmed when they were attacked by the invader within their own minds. 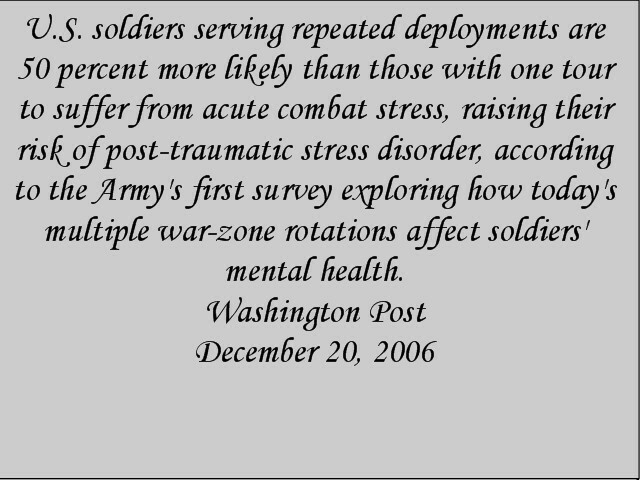 While we have come a very long way in the last ten years addressing Post Traumatic Stress Disorder, the numbers show there is something missing. Until they actually discover what causes PTSD and really understand it, we will see the numbers continue to grow. Former Marine Sgt. Dana O’Brien can barely make it through the first line before tears begin streaming down his face. It was sent from his grandson, Marine Cpl. Daniel O’Brien during one of his two tours of duty in Iraq. On the surface, Cpl. O’Brien appeared to have a lot to live for. He was a good Marine with a promising career ahead of him. And he had a beautiful baby girl, Alexis, who, it is clear from the photographs of the two, really seemed to love her daddy. But on the inside, O’Brien was tormented. His wife, also a Marine had recently left him. And after an altercation on base at the Marine Air Station in Buford, S.C., he thought his career was over. In July 2009, he took his own life. O'Brien's death was part of an alarming trend: Fifty-two Marines committed suicide that year, a record high, and the military is still struggling to deal with an elevated suicide rate among those who serve. As if suicide wasn’t enough of an issue in the military, the problem may extend beyond the services. Gen. Ray Carpenter commands the Army National Guard, where the incidence of suicide nearly doubled from 2009 to 2010. Psychiatrists have told veterans that if they were not affected by what they went through, they would become a sociopath. While this in no way explains why some come home without suffering from PTSD, it was an easy out for them. Point one they miss is age. The emotional part of the brain in all of us is not fully developed until the age of 25. Most of the men and women we send enter into the military right out of high school. PTSD only comes after a traumatic event. It is not genetic. Growing up with someone with PTSD, especially untreated PTSD, is traumatic and can cause secondary PTSD. 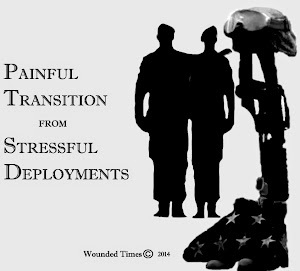 Redeployments increase the risk of PTSD by 50%, which the Army discovered in 2006, but the practice continues. This slide was from one of my videos, Wounded and Waiting. Every effort has not been made to address this. They knew what redeployments would do but as they spent millions of dollars on programs with no evidence of them working, they expanded the list of like programs, recently shown to have been more "research" than treatment. PTSD strikes. It is not caused by the veteran. Given what knowledge is available, including brain scans, there are key points missing in treating veterans of combat. Providing knowledge is wonderful however the mistakes made originate with the wrong information being provided. Programs like Battle Mind begin by telling the servicemen and women that they can prevent PTSD by becoming "resilient" and preparing their minds. This not only did not work, it did more harm than good. It suggested to them that if they ended up with PTSD it was their fault. Providing true knowledge of what PTSD is does in fact help them to heal faster and make peace with what they just went through. Humans walk away from traumatic events one of two ways. They either believe they were saved by God/divine intervention/someone watching over them, or they believe they are suffering for a reason/in the wrong place at the wrong time/abandoned by God/targeted by God. Shock is what comes after traumatic events. Usually within 30 days, the shock wears off. While the person is changed by the event itself, they are not traumatized by it. Recovered, they take the event with them stronger for having survived it, more loving with a different idea of what is important, along with other good changes or they can go the other way. On the extreme end is the symptoms getting worse and taking over the life of the survivor. The soul/spirit is connected to our emotions and must be addressed in healing. When psychologist listen to the event that haunts the veteran the most, they can address that, get the veteran to the place where they are able to "watch the whole movie" in their mind about what happened before the event, during it and after, so they can be able to find peace with what they did or what happened. Forgiving themselves and being able to forgive others is necessary in healing. They need to be guided in achieving this. This can be done with mental health professionals and members of the clergy, as well as informed friends. If they are being judged at the same time they are blaming themselves, it feeds guilt already there and fuels what PTSD is already doing to them. The military has a history of avoiding the emotions of the humans they turn into warriors. They plan and program training around changing them, breaking them as individuals to turn them into a unit, but no matter how much they want to delude themselves into thinking this can be achieved, they end up with a human suddenly afraid to be human. History is full of civilizations honoring the human turned into warrior appreciating the gifts each one is capable of while still acknowledging the weakness of being just a human. 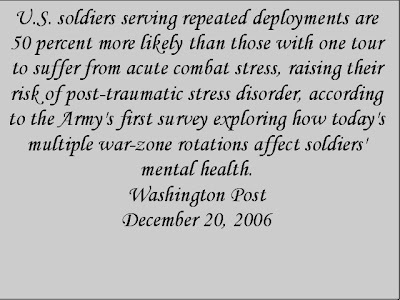 When the military comes to terms with this fact, then there will be a lot less suffering from PTSD and a lot more healing it. Families also play a key role in addressing the aftermath of trauma when they are included in on the treatment. Often the veteran will deny the seriousness of what is happening to them but the family can provide truth. 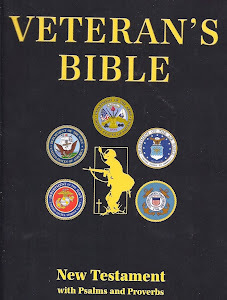 They can also aid in the day to day lives of the veterans when they know what to do as well as what not to do once they understand what they need to know. PTSD is complicated but there is so much more known now than ever before. We all need to be asking why the military keeps repeating the same mistakes instead of learning from them. HONOLULU — One Marine was killed and three injured when a helicopter crashed into a bay on the coast of Oahu, a military spokesman said Wednesday. The CH-53 D Sea Stallion, with four Marines aboard, crashed about 7:20 p.m. Hawaii time Tuesday, Maj. Alan Crouch, with the Marines' public affairs office in Hawaii, told NBC News. There are a a lot more stories out there but for the sake of time, I pulled some from my blog because I have been noticing an increase in police responding to veterans. The last year has shown a huge increase, which is a very troubling sign most of what is being done has not worked. Veterans Courts are great but they do no good if the police officers are not trained properly on how to help these veterans in order to get them into court alive. Take a look at some of the dates. I removed the last names other than Staff Sgt. Travis Twigg. His death was reported all over the country. Staff Sgt. Travis Twigg, 5 tours, killed himself and his brother at the Grand Canyon after police closed in. He had PTSD and even met President Bush. John L, Iraq Veteran, Lake Stevens Washington, three tours. Shot after domestic disturbance. Unidentified “war veteran”, Laredo TX, survived standoff and taken to be helped. With Veterans Courts there is hope but the challenge is getting them from police responding to stay alive long enough to get to one of them. There are more and more law enforcement officials talking these veterans to the VA hospital instead of jail, so that helps too. For the veteran already in jail, the VA is trying to address that too. cutting back on repeat offenses. who otherwise qualify for VA health care." As a chaplain of the 512th Airlift Wing, Lt. Col. John W. Groth made certain that the remains of fallen military personnel were given a dignified transfer at the Dover Air Force Base mortuary. It was his role to pray during the arrival of a flag-draped transfer case and be present during the examination of remains. He was ready to listen if mortuary staff needed to talk about how hard it was to deal with the sights, sounds and smells of death. "I was absolutely proud of seeking to bring dignity, honor and respect to my role at the base," said Groth, a reservist who saw off-and-on service at the mortuary over eight years. By 2009, he was part of a base team that had processed more than 4,500 remains from the nation's conflicts. The mortuary is an operations center for the wars in Iraq and Afghanistan, and in some ways working in the mortuary is like a funeral home. But combat death can batter human tissue with horrific force, and that leaves a lasting impression when body bags are opened. And while Groth became accustomed to looking after others, he was not tuned into the subtleties of his own well-being. When Franck Kaiser came home from the Vietnam War, a clerk fired obscenities at him instead of giving him change for $20 so he could call his family and let them know he was home safely. Kaiser had arrived on a charter flight to Travis Air Force Base and was bused to San Francisco International Airport, where he would take another flight to get to Fort Hood, Texas, after being awarded three Purple Hearts for injuries suffered during a year at war. Many Vietnam veterans encountered the same kind of hostility and indifference when they returned home to a nation deeply divided politically over the war. On Wednesday, 36 years after the last Marines and others withdrew from Saigon, the nation will recognize "Welcome Home Vietnam Veterans Day," thanks to a resolution unanimously passed by the U.S. Senate. 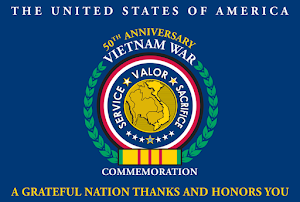 It's not a national holiday, and some local veterans were caught unaware of the resolution in which the senators encourage Americans to recognize the sacrifices of Vietnam veterans. "We weren't welcomed very well, so it's good that the Senate chose to recognize our homecoming," said Kaiser, 66, executive vice president and chief executive officer of the Home Builders and Contractors Association of Brevard. "I think its great." When they come home, sooner or later, they want to go back. They wanted to go back to Vietnam. They wanted to go back to Afghanistan. They wanted to go back to Iraq. Why? Why would anyone want to go back to where they were considering their lives were on the line everyday? You'd think they would want to just go back to the lives they had before. It's an easy assumption to make but you'd have to consider that they are no longer the same person to understand why they want to go back. Home is a different place. The place they lived in is the same. The family and friends they left are still the same. They are no longer the same. Profound changes happened in the way they think about everything because of their experiences. They stopped being "Joe" the civilian high school student worrying about passing a test or scoring a prom date. They became "GI Joe" worrying about staying alive. Instead of being able to go back, pick up their lives where they left off, nothing is ever the same. Readjustment after combat is a tough thing to do but it is almost impossible if they cannot make peace with the changes that happened within. Let's take a look at our own lives and how things are different for us. A new Mom comes back from the hospital with her baby and we know her life will never be the same. She has a baby to worry about, wake up for, take care of and for the rest of her life, she is responsible to do the best she can for her son or daughter. The moment she walks into her home, life as she knew it, ended. People understand why the baby comes first. A family walks around what is left of their home after a tornado destroyed it. They find a couple of things they had in the ruins and they know their lives will never be the same. They will live in another place, buy different things, but they will never again feel as if anything is forever. Their values change. They know that the things they had really don't matter when they are gone. People understand why they know longer place so much importance on "stuff" they own. Death is another changer. A wife buries her husband after 50 years together. Life as she knew it ended. She starts another chapter of her life alone. People understand why she no longer wants to come for a visit or starts to do other things to fill up her days. We can understand these changes but we can't understand when a man or woman comes back from a strange country where they saw so much. We expect them to be the same. We don't expect them to think differently, dream differently or act differently. When they act out of the ordinary, we are not able to understand as much as we are able to regarding other people. All of us need to open our eyes and help them to find peace with the changes inside of themselves they cannot heal as much as we need to help them heal what they can. Be there to listen when they want to talk and only for as long as they want to talk about it. When they want to change the subject, let them. Stop telling them to get over it or to put it behind them. Stop wanting them to go back to the way they were before. If they don't want to go someplace, go by yourself without anger or hurt feelings. If they need to sit in a certain place at a restaurant, let them sit where they feel comfortable. If there seems to be bigger issues going on, then find out what PTSD is and learn how to help them as much as you need to know how to help yourself. Help home to be a place where they feel as if they belong again. This gets me very angry. I tried for the last couple of years to raise enough in donations to cover my expenses the right way and ended up losing. I traveled a lot, but now I don't go unless someone pays for me to come. I just can't afford to do it anymore. The money I paid out of my pocket ended up being a deduction for the organization I belonged to and I couldn't find any financial support. That is why the PayPal link is gone. I am still not sure if I'll open another account or attempt to have a non-profit of my own ever again. I lost over a $1,000 every year but here is someone accused of doing it the wrong way but getting support. Maybe it is true that it is not what you know, but who you know because even if he knew how to work the system, he would have to have had someone supporting him, giving him publicity and connections to raise funds. So who was behind this charity giving him support and how do they feel about this report? ST. PETERSBURG, FL – The Rev. Bruce Wright, a well-known local Homeless Advocate who has been soliciting donations for many years under the guise that they were IRS 501(c)(3) Tax-Exempt Charities whose programs are supposed to help the poor and homeless, including homeless Veterans, who when asked by this Reporter, could not or would not produce IRS Forms 990 or any other Financial Statements nor any kind of Registration of these Charities with the IRS and Florida Department of Agriculture and Consumer Services (FDOACS) WHICH IS REQUIRED BY IRS AND Florida Charity Laws. The responses I received from Wright are set forth below at the end of this story. A search for Wright’s most recent 2011 Incorporated Non-Profit called the REFUGE COLLECTIVE found that it’s only registered with The Florida Secretary of State as a Non-Profit Corporation but is not registered with the IRS or FDOACS. Additionally, a search for Refuge Ministries and The Refuge for which Wright is well-known in associating, and advertising and soliciting donations, are not registered with the FDOACS or IRS. And Sanctuary Youth Center which Wright advised me in one of his e-mail responses below are not listed under the auspices of the Florida Baptist Convention which Wright told they were. Police said Pulaski had been involved in another shooting outside a Glendale restaurant just moments before he was stopped by the officer. The Arizona Senator, the man who wanted to be President, none other than John McCain said, "maybe you need this in New Jersey, but we don't need this in Arizona" when asked why he as against the suicide prevention bill. You'd think that as a Senator, he'd be very aware of what veterans of Iraq and Afghanistan come home with. It isn't just suicides but crimes committed because they didn't get the help they needed. Jeremiah Pulaski knew how to use a weapon but the man he shot was not killed, suggesting he didn't want to kill him. The man he shot was still shot over some words said. Pulaski's family and friends are left stunned by what happened as they prepare for a funeral that didn't need to happen. Police officers are dealing with a shooting that didn't need to happen. Ann Lupeika says that even though her step-nephew died in Phoenix, Jeremiah Pulaski was a victim of the war in Afghanistan. Pulaski was fatally shot early Saturday morning by a Glendale police sergeant who authorities said was returning fire. Pulaski 24, had recently returned from an Army stint in Afghanistan. "He's my hero," said Lupeika. "I feel really bad that it came down to whatever happened that night." Police said that about 1:30 a.m. Saturday, Jeremiah Wilson Pulaski and a friend left Tony's Cocktail Lounge near 59th Avenue and Greenway Road. A man approached them and the conversation turned hostile. Pulaski drew a handgun and shot the man, who did not suffer life-threatening injuries, police said. The numbers of seriously injured servicemen and women coming back from the conflicts in Iraq and Afghanistan continue to climb. 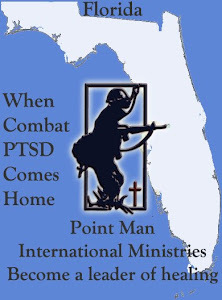 Besides physical wounds, many return with severe post traumatic stress disorder that goes undiagnosed for months or even years. But there’s a new organization dedicated to helping these wounded warriors. Soldier Aaron McCarthy was on patrol in Iraq several years ago when a roadside bomb exploded. “Knocked me out of the turret and I jumped back in,” he says. With his right arm torn up, a serious head injury and recovering at home, it finally hit him. But the realization that it was post traumatic stress disorder and a brain injury that had changed him didn't come right away, as it doesn't for many wounded warriors. “I’m OK, I’m taking a couple of pills and it’s OK with me,” said McCarthy about that denial. Over time the nightmares, tremors and stress took a toll. SOCASTEE, SC (WMBF) – Inside a modest house in Socastee, SC, a veteran and his wife are in the battle of their lives. They're trying to save their home, and their marriage. Matthew Stoddard served overseas in Kyrgyszstan after 9/11 in support of America's war in Afghanistan. But, whatever happened over there may have followed Matthew home. "He started changing," said his wife, April. "He would be angry. He would be hateful." This veteran of the post-9/11 fight has post-traumatic stress disorder. "The relationship he had with the kids started to be non-existent," April recalls. "He had alienated all of us. And I was afraid. I was seriously afraid." She was scared their marriage would end, too. However, through the Veterans Administration, Matthew got medication and treatment. April says he's doing better, but he's far from being healed. "I'll just be sitting here and all of a sudden my shoulder will just start hurting," Matthew Stoddard recalls telling a doctor. "Or, I'll just move it…and I'm on my knees about ready to cry because of the pain." The Stoddards say they have faced endless bureaucracy, sometimes out-and-out disrespect, and incompetence from the government as they've tried to get help. 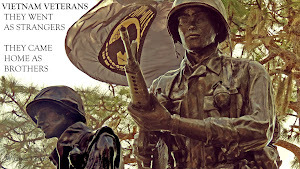 Mar 26, 2011 (KSWB-TV - McClatchy-Tribune Information Services via COMTEX) -- Balboa Park, Calif-- Two homeless veterans were buried in a full military service at Veterans Museum and Memorial Center at Balboa Park. "We bring them in here and we adopt them into our family, then we bury them," said David Brown, a veteran and organizer of the monthly funerals. 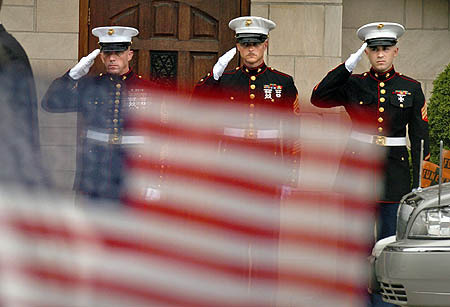 Once a month, San Diego county veterans groups hold memorial services for indigent veterans. Saturday Edward Loux, who served in the US Army and Charles Schulken, who served in the US Navy, were laid to rest. "It 's only right that we take care of our own, our own brothers and our sisters," said Thomas Mowery. Mowery served in the US Army 1980-83 and now volunteers as a pallbearer. "These people dedicated their services to this country and they deserve our respect," said Mowery. What part of Post Traumatic Stress Disorder is not being understood here? PTSD only comes from a traumatic event. Many people were outraged when Kwame Kilpatrick's doctor says that the ex-mayor suffers from post- traumatic stress disorder. Crying first thing on a Sunday morning is not a good way to start the day but while reading this, that is exactly what happened. 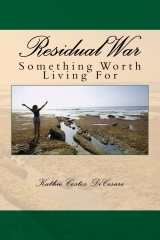 I had a voice in my head crying out in anguish because of "training" the Marines gave him. Back then, it was called Battle Mind. This program was supposed to help them become resilient but it did more harm than good. He was in his early 20's, back from Iraq for a couple of months. He was sitting outside the Orlando VA clinic with a buddy as they were filling out paperwork. We were talking and suddenly, he was crying. He was sorry to be crying in front of me. He said, "Ma'am you just don't understand. I'm a Marine. We're not supposed to cry." 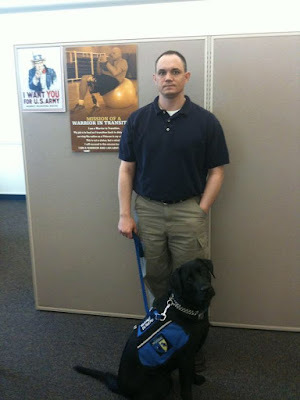 We talked for a while more and then he told me that he thought he failed to train right, so he "got" PTSD. He believed it was his fault. This is what Battle Mind did. It began by telling them they could train their brains to prevent it. This sent a message to them that if they ended up with PTSD, it was because they didn't do it right. No one told him that he trained to do his job in Iraq and did it right. No on told him that he didn't lack courage because no matter what kind of pain he was in, he still did his job, watched the backs of his friends and spent every day with honor. His first concern while deployed was for his buddies. When they were all out of danger, then he allowed himself to feel the pain he carried all that time. There is so much being done under the claim of helping when the evidence has shown more harm than good being done. Losing more after combat proves the claims fall flat but the pain is very real. This report is about how steps taken to help them are doing more harm than good. God willing someone with the authority to do something about it will stop these kinds of programs and stop sacrificing their lives so a company can make money. They are doing "research" while calling it training. In other words, the troops have been used as guinea pigs instead of being helped to heal. It is also important to note here two controversial aspects of the Comprehensive Soldier Fitness program that have already received attention from investigative journalists. First, Mark Benjamin has raised provocative questions, not yet fully answered, about the circumstances surrounding the huge, $31 million no-bid contract awarded to Seligman ("whose work formed the psychological underpinnings of the Bush administration's torture program") by the Department of Defense for his team's CSF involvement. The Marine above carried more pain than he needed to carry. Aside from the fact he was brave when he needed to be and human when he didn't need to be brave anymore, no one told him that the fact he cared so much, no matter what he was going through, showed great compassion. We talked about God and how all the evil done in this world can be allowed. No one told him that when he felt compassion in the middle of all that horror, God was right there because he was. The Chaplain he talked to while deployed told him that he was not a member of the "right" faith and he needed to convert. There was no mention of God's love, how to forgive and how to be forgiven. We fail them in so many ways, I think I need to go an cry a bit more after reading this report. Why is it that soldiers always seem to wonder where God is when they see the worst man is capable of? Understandable to be sure when they see so much death, destruction, misery and horror. Why can't they see that God was there, even with all of that, because they were there? They manage to find so much compassion within themselves that a picture like the one above proves. How can they endure so much yet still be able to care so much for a friend? They can because the love they had inside of them all along was stronger than anything else. 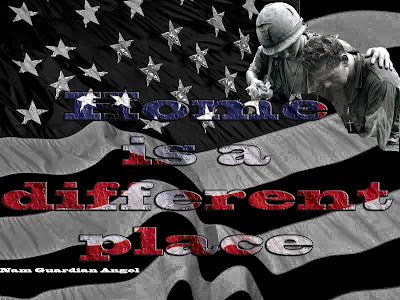 I was talking to a Vietnam veteran a few hours ago and he had the usual impression about coming home. He said all of his friends changed while he was gone. He didn't feel as if he fitted in anymore. I asked him if he thought his friends changed or if he was the one who changed. He said looking back he guessed he changed. They leave the rest of us and go places none of us can really understand. They do things none of us will ever know. They return home to family and friends frozen in time, worrying about the same old tiny problems, the same drive to buy more things, go out and enjoy life while the veteran has taken a look at the other side of the world. His view has changed. He sees things differently and one thing he notices in the people in his life is they have no idea. They have no patience for us not feeling like going into work because they spent a year of 24-7 risking their lives when they felt like it and when they didn't want to. One member of the family takes long showers when they were lucky if they had a few in the whole year. They can't stand greed when people have more than they need but won't share because they just left other people with very little but a huge desire to share what little they had with them. There is so much more that we keep missing about them but I believe you get the point. They did not let go of the compassion they had for others no matter what they went through but we blame them when they don't snap out of it and go back to the way they were before. Maybe we should be wondering why we didn't change considering how much someone we cared about just went through. How can we hold the same set of values and hang onto petty complaints when they just got back from hell? Yet even in that hell called a war, they found people with compassion, mercy and love no matter what was happening there. The Old Testament is filled with God's wrath but the New Testament is filled with His love. Some still cannot come to terms with what freewill is anymore than they can accept the evil man is capable of doing to others. They want to blame God, say He doesn't care, because that is easier than facing the truth that as long as there is someone caring about another person, He lives right there. God was there all along because they were there and still able to care. Where is Toledo’s Missing History? A local military historian would like to know where all the artifacts have gone that used to be displayed at the Toledo Zoo? Nick Haupricht has been looking into the mystery of the missing artifacts for several years and says he has reason to believe that hundreds of items, including historic weapons, artworks, uniforms, badges and even cannons were stolen over the years and he’d like the Attorney General should launch an investigation. “Our history was stolen from us”. Twenty-nine years ago, I was introduced to Post Traumatic Stress Disorder, initiated into the Vietnam War by a 30 year old veteran. It was 11 years after he came back home part way. Aside from living with it, I've spent all these years tracking it. As an expert, I can tell you that we have never seen so many studies and attempts to help the veterans heal as we have today. 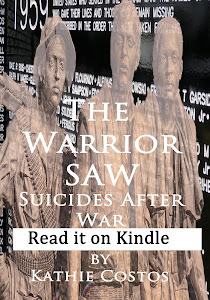 While this fills me with great hope, it also serves as warnings because with all that is being done, there are still increased numbers of veterans reaching the point where they feel so much hopelessness, they are on the brink of suicide. The Suicide Prevention Hotline received over 55,000 calls in the first year according to a report from SAMHSA, Substance Abuse and Mental Health Services. 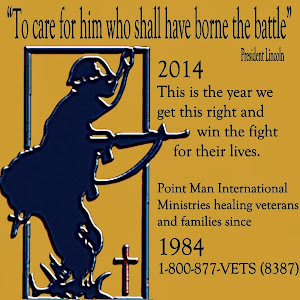 To date, more than 379,000 callers have called the Veterans Suicide Prevention Hotline, and more than 200,000 of these callers have identified themselves as Veterans or family members or friends of Veterans. 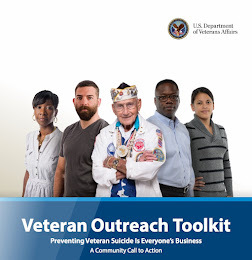 To date, the hotline has led to more than 13,000 rescues of actively suicidal Veterans. Yet there are still 18 veterans a day committing suicide. What is even more troubling is the fact that until this month, the active duty military did not have access to suicide prevention. Even if it was possible to track all the suicides and attempted suicides, we'd never really know all of them. There are drug overdose deaths that are never really clear if they were accidental or suicide. Accidents are never really clear when they result in death. No one is checking on the incidents involving law enforcement when a veteran with PTSD is involved. Why, after all these years did over 379,000 calls have to be made in the first place and why were over 200,000 of them from veterans? Why does it still reach that level of pain this keeps happening? Because the programs they have in place are not working even though they are clearly helping some. What is missing? The families are. Their role in all of this is often overlooked and they are one of the most important resources. It is troubling something like this is found on the National Suicide Prevention Hotline site. "Super heroes fight a lot of battles, but there are few more important than combating suicide," said Tom Brevoort, Senior Vice-President of Publishing. "That’s why we're making Captain America: A Little Help available for free via our digital comics outlets. If even one person calls this number instead of doing something very tragic, we know that means we succeeded." 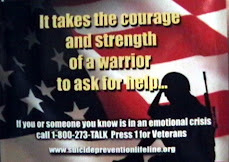 Suicide Prevention Lifeline.org page tells veterans to press 1 to talk. Yet on the same site, the same page, Captain America is right there at the bottom and he's battling a bunch of guys dressed in green. This is not a good idea no matter who it was intended for to show up on the same page telling veterans to seek help. Without knowing what to do, families like mine did the best we could without any support or knowledge at all. 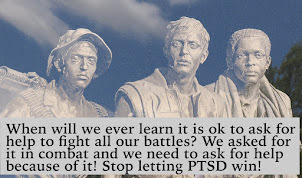 Most of the mistakes made living with combat PTSD, were all made many years ago and we learned from them. 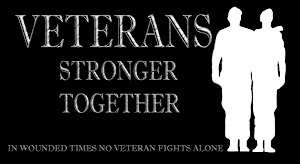 We are yet one more untapped resource in helping the veterans heal because we live with it everyday. 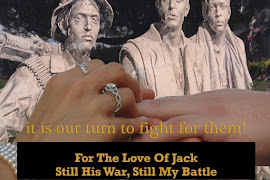 Many wives have been married for 30 or 40 years, keeping their veteran alive and raising their families with nothing to lean on other than love. I can tell you first hand, back when all this was new to me, I would have paid any price for the resources available today, especially the online support but too many do not take advantage of it. These are lifelines! 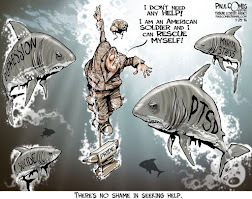 They need to reach for them but their excuse is, they have enough to worry about so they discover PTSD when it is too late to avoid a lot of anguish. Families can make it better when they understand but they are left out of the healing with mental health workers. They need to be included in the therapy as much as they need to be clued in. These are the key recommendations Rand offered. Families are missing from the action. Responding appropriately when suicides occur. While these are very important, they miss a big one and that is the family. Family can be relatives or it can be very close friends, because facing reality there are many serving without a strong family behind them. We see it when they come home from deployment. They get off the bus without a spouse to greet them, without Mom or Dad showing up to hug them, so they stand with their friends. Their friends are as close to family as there is. Yet families are not the only problem. There have been suicide reports from across the country when the family knew what PTSD was, got the to go for help and offered all the support in the world, but it was still not enough. This suggests the programs offered to help them heal were not good enough. One more indication changes have to be made to make sure the programs live up to the challenge these veterans come home with. HAMPTON, Va., March 25, 2011 – A new study commissioned by the Defense Department affirms many of the suicide-prevention efforts being made within DOD and the military services and recommends ways to strengthen them. In preparing “The War Within: Suicide Prevention in the U.S. Military,” the Rand National Defense Research Institute examined data on military suicides, identified what scientific literature and leaders in the field consider the best prevention strategies and recommended ways to ensure existing programs reflect the state of the art, officials said. The study’s findings track closely with those in the Defense Department’s own DOD Suicide Task Force Report, Barnes told military health care professionals attending the first Armed Forces Public Health Conference held here this week. “The Rand study helps us to identify areas that need improvement so that we can continue to provide the most comprehensive health care for our service members –- from the inside out,” he said. -- Responding appropriately when suicides occur. Evaluating the Defense Department’s suicide prevention programs, the study cited the potential benefit of a new DOD-wide surveillance program being used to track suicides and suicide attempts. The DOD Suicide Event Report replaced each service’s individual suicide-reporting system, Barnes explained, helping to ensure “apples to apples” comparisons as information is shared across the services. Rand also called for an evaluation of existing suicide prevention programs, along with a requirement that any new initiatives include an evaluation plan. Barnes acknowledged the challenge of assessing programs’ effectiveness, but called closer collaboration and information sharing across the Defense Department and services a positive step toward sharing best practices and determining what works. The Rand study recognizes most military suicide-prevention programs’ focus on raising awareness, including telling people where to get help and helping them recognize peers in distress. However, it emphasizes the importance of also teaching military members how to recognize their own problems and refer themselves if needed to a behavioral health professional or chaplain. “Raising awareness and promoting self-care is something we do and we can do better,” Barnes said, noting the value of resilience campaigns. “The ideas is to give people skills,” and know how to recognize signs of risk in themselves as well as others, and to know what to do. The report also identified the importance of partnerships between agencies and organizations responsible for mental health and substance use and other known risk factors for suicide. The study also cited the need to ensure there’s no gap in services provided during military members’ transitions -- between military bases, between commands or between active and reserve status. The study called for formal guidance for commanders so they know how to respond to suicide and suicide attempts. It recognized the lack of any direct policy within the services and the risks of handling these situations improperly. One more important factor in all of this is who was behind all of these programs starting in the first place. 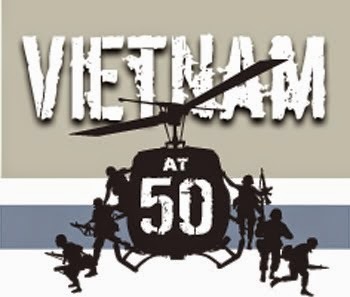 Vietnam veterans and their families pushed for help in the beginning. Still we wouldn't know as much as we do now about how huge the problem is had it not been for groups like Veterans For Common Sense and Paul Sullivan making sure they got the right information. 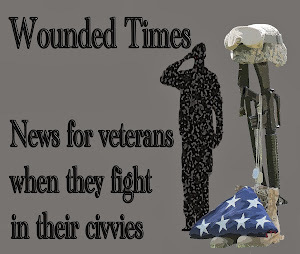 They have been filing Freedom of Information Act requests for years to find out what the truth is and it has been pretty dark for the veterans behind the idyllic image of veterans joyous homecomings. 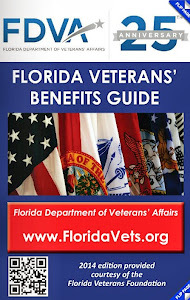 The VA and the DOD can come out with programs without providing any proof these programs work and the general public would take it at face value. The truth would be hidden behind the claims, as it had been until VCS fought to make sure the truth was told. The same truth hundreds of thousands of families live with year after year when the rest of the country has forgotten all about the battles they were sent to fight. There is hope in all of this as long as the American people refuse to allow more to die when they come home from war than during it. Demand answers from the media. Why are so many still committing suicide when so many have been calling suicide prevention? With all the programs millions of tax payer dollars fund, why aren't they working? Why do veterans still feel on the brink of suicide they need to call for help? With all the attempts to address the stigma, why are so many still afraid to ask for help? Why are so many getting help still committing suicide? There are very serious questions needing to be asked, but the media doesn't seem interested enough in asking or they lack a clear understanding to even know how serious all of this is. Make sure they discover what the reality is for too many when they come home before it is too late for too many more. VICTORVILLE, Calif.—A man accused of bludgeoning an Iraq War veteran to death with a hammer in an unprovoked attack was convicted of first-degree murder. A San Bernardino County jury took about a half-hour this week to convict Johnny Acosta. The 46-year-old Hesperia man has two previous felony convictions and faces 81 years to life when he is sentenced on Tuesday. He was not eligible for the death penalty. Acosta was convicted in the death of Trevor Neiman, 25. The former Marine, who survived three overseas tours, is fatally beaten with a hammer in Victorville in what authorities say was an unprovoked attack. As a Marine, Trevor Neiman survived three tours of duty in Iraq, where he patrolled the deadly streets of Fallouja and lost some of his best friends. A knife attack at his Phelan home in May left the muscular man with a punctured lung, broken ribs and a ghastly head wound. But that didn't stop him from following in his father's footsteps and becoming a cable TV installer. On Monday, Neiman, 25, went to a Victorville home. While he was inside, a man grabbed a hammer and fatally beat him. "There was no exchange of words. There was nothing that occurred before the unprovoked attack," said Jody Miller, a spokeswoman for the San Bernardino County Sheriff's Department. Paramedics rushed Neiman to Victor Valley Community Hospital, where he died of his injuries. Authorities identified the alleged attacker as Johnny Acosta, 45, of Hesperia, a relative of the homeowners. Acosta fled the home after the 4:30 p.m. attack, but later surrendered to detectives without a struggle. He was booked on suspicion of murder and was being held without bail at West Valley Detention Center. Acosta is scheduled to appear in a Victorville court Thursday. The motive for the attack remains unclear, Miller said. When they die during combat, we say "Fallen" and when they die as cops, it becomes "in the line of duty" but when they die by their own hands after surviving all of it, we don't seem to have the right words to use. Like many in the military, Staff Sgt. James Wilson had a tough exterior. He had a take-no-crap attitude, was always focused on his next mission and when you gave him a job to do, he did it right the first time. But those who knew the 42-year-old Highspire man well said Wilson also had a lighter side. He loved to make people laugh, played practical jokes and often could find humor in serious situations. Most of all, though, Wilson was emotionally grounded, his friends said, which is why everyone seems baffled that he would take his own life. Wilson, a part-time Highspire police officer, shot himself in the head Sunday night after he crashed his Jeep on South Eisenhower Boulevard in Lower Swatara Twp., police said. A member of the Pennsylvania Army National Guard’s Company C, 1st Battalion, 110th Infantry, Wilson had returned from Afghanistan in November after being stationed there about nine months. Wilson survived the crash, the police chief said, but died from the gunshot wound. A witness who walked up to the Jeep about 8:30 witnessed the shooting, Chief Richard Wiley said. From 2005 to 2009, more than 1,100 service members took their own lives, an average of one suicide every 36 hours. Wilson’s friends weren’t aware of any personal problems he might have had. He joined the Marines after he turned 18 and had previously been deployed to Iraq with the 56th Striker Brigade before he was sent to Afghanistan in February 2010. Pfc. Michael C. Mahr, 26, of Homosassa was killed Tuesday. A soldier from Florida was killed this week in Afghanistan, the Department of Defense announced this morning. Pfc. Michael C. Mahr, 26, of Homosassa and Staff Sgt. Joshua S. Gire, 28, of Chillicothe, Ohio were killed Tuesday in Logar province of wounds suffered when enemy forces attacked their unit with an improvised explosive device, rocket propelled grenades and small arms fire, the Department of Defense said. The soldiers were assigned to the 54th Engineer Battalion, 18th Engineer Brigade, Bamberg, Germany. PETERSBURG, Va. — Eighty-four soldiers are due back at Fort Lee after a yearlong deployment to Iraq. The soldiers expected back Thursday night are with the Army’s 240th Quartermaster Battalion. During their deployment, the soldiers worked to plan, control, maintain and regulate the Army’s fuel supply in Iraq. Family and friends are expected to welcome them home. FAYETTEVILLE, N.C. — Authorities said Thursday they looking for a man who shot and killed a Fort Bragg soldier, who had been working as a security officer at a Fayetteville nightclub. Cumberland County sheriff’s spokeswoman Debbie Tanna said Breon Joseph Smith, 28, was shot about 2 a.m. Thursday at the Congo Club. Smith was assigned to the 656th Maintenance Battalion. Authorities said a man and his companion had been asked to leave the club after becoming loud and boisterous. Sheriff’s deputies said they have issued a murder warrant for Kenneth Ronald Clark, 28, of Fayetteville. The Camp Pendleton unit that has seen more troops killed and wounded in action than any other Marine Corps unit in the 10-year-old Afghan war is coming home. The 3rd Battalion, 5th Marine Regiment will return in a couple of weeks ahead of a wave of other units from the base's I Marine Expeditionary Force. The lead role in Afghanistan is being taken over by the II Marine Expeditionary Force based at Camp Lejeune, N.C. A transfer of command ceremony is set for Saturday at Camp Leatherneck, the main Marine base in the southern Helmand province where most Marines are assigned. At that ceremony, Camp Pendleton Maj. Gen. Richard Mills, who has overseen the fighting by the 20,000 Marines in Afghanistan for the last year, will relinquish that command and return home. The number of locally based troops at war in the south-central Asian nation will fall from slightly more than 10,000 to about 7,000 by the end of spring and down to about 2,000 by midsummer, said 2nd Lt. Joanna Cappeto, a Camp Pendleton spokeswoman. Among the most anticipated homecomings is the return of the battered 3rd Battalion, 5th Marine Regiment, whose nickname is the "Dark Horse Battalion." The approximately 950-member infantry unit was engaged in heavy fighting in the Sangin District of the Helmand province from the time it arrived there at the end of the summer until recent weeks. The region was rife with Taliban insurgents, who used the district as a haven for illicit drug trafficking and manufacturing roadside bombs. In its aggressive pursuit of the insurgents, the battalion saw 25 of its members killed in action, most of them from the bombs that are the weapon responsible for most U.S. and NATO troop casualties. More than 150 battalion troops were wounded, including more than a dozen who had single- or multiple-limb amputations. One of the men wounded in that fashion was Oceanside resident Lt. Cameron West, a platoon leader who lost a leg and suffered other injuries in an Oct. 15 blast while leading a patrol less than three weeks after arriving in Afghanistan. VANCOUVER, Wash. – The youngest of the rail workers who died Wednesday, when the SUV he was riding in was hit by a train, took great pride in training to be a train conductor with Burlington Northern Santa Fe Railroad. Christopher Loehr, 28, graduated from Skyview High School in Vancouver about 10 years ago and also took pride in his physical fitness. His aunt, Cindy Ohm, said he went into the army and served two tours in Iraq doing dangerous patrols with the 7th Cavalry. In January, he landed a job with the railroad and moved to the Seattle area. Also killed, 58-year-old engineer Tom Kenny, a 22-year veteran out of Seattle, and the driver of the van, 60-year-old Steven Sebastian of Castle Rock. Dwight Leonard Hauck of Auburn, Wash. survived and is in critical condition at Oregon Health and Science University in Portland. As hard as it must be to have his wife missing, especially pregnant, it must have been torture for him to be in Afghanistan for the last two months. They just sent him home last week! Emile Decker, the missing woman's husband and father of her toddler, deployed to Afghanistan with his National Guard unit on Feb. 2, but he returned to Virginia last week. Why didn't they send him home a long time ago? What was it like for him to be so far away and unable to get back home for his child and help search for his wife? Loudoun County sheriff's deputies returned to Ashburn, Va., Thursday to search for clues in the disappearance of the pregnant wife of a man who was serving in Afghanistan, NBC Washington's Julie Carey reported. Bethany Decker, 21, disappeared two months ago. She is believed to be about six months pregnant. Deputies combed the fields and woods across the road from Decker's apartment building, where her boyfriend last saw her on Jan. 29. No obvious clues or evidence was recovered, but Capt. Ken Pratt, of the Loudoun County Sheriff's Office, said deputies did find some things worth checking out further. VICTORIA — A B.C. soldier deploying to Afghanistan Thursday made a pit stop on his way to the airport, saving two people from a house fire in the Victoria area. Master Cpl. Carol Bastien was en route to the airport early Thursday morning when he noticed flames consuming the balcony of a family home. M. Cpl. Bastien leapt out of the car, ran into the house, woke the family, battled the blaze and then called the fire department — all before rushing to the airport where a plane was waiting to take him to Afghanistan for his first tour of duty. A senior petty officer died Tuesday aboard the aircraft carrier Enterprise stemming from a “non-combat related incident,” according to a Defense Department news release Wednesday. The circumstances surrounding the death of Aviation Ordnanceman 1st Class (AW) Vincent Filpi of Fort Walton Beach, Fla., have not been disclosed. 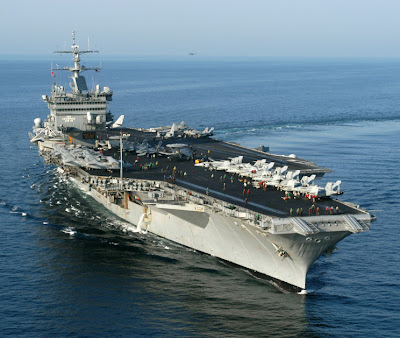 A Navy spokesman said that there is an investigation into the incident. Experts weigh in on physician’s claim of PTSD "cure"
Former Army physician Dr. John J. Prendergast is either a therapeutic prophet who has invented a miraculous cure-all for everything from clogged arteries to post-traumatic stress disorder or a modern-day snake-oil salesman making irresponsible, possibly dangerous claims about his vitamin supplement. It all depends on who you believe. Prendergast was a Vietnam-era Army doctor — military records he provided to Military Times confirm that. After that, much of his story doesn’t add up. Prendergast says he helped invent ProArgi-9 Plus, a powdered multivitamin drink mix with a “proprietary blend” of the amino acid L-arginine, red wine extract and other ingredients. The mix is sold by Synergy WorldWide. Described by the company’s president as a Synergy spokesman and member of its medical advisory board, Prendergast, or “Dr. Joe,” as he is known on the product’s numerous websites, claims he was influenced by world-renowned scientists and endorsed by the American Diabetes Association for “rolling back the ravages of diabetes.” He says his elixir has cleared the clogged arteries of thousands of diabetics. But the scientists to whom Prendergast links himself say he is using their names and work against their wishes. And the American Diabetes Association says the only thing it has ever given him is a regional father-of-the-year award that had nothing to do with his medical practice. YUMA, Ariz. — Authorities confirmed yesterday that a US Marine from Maine, reported missing last week, was found dead in an irrigation canal in Yuma, in southwest Arizona. The body of Corporal Joshua Barron, 22, was discovered by a farmer Monday, said Captain Eben Bratcher, Yuma County Sheriff spokesman. He was reporting missing March 16. There was no sign of trauma, and foul play is not suspected, Bratcher said. Barron was initially identified because his name was tattooed on his shoulder. The Marine Corps helped confirm his identity, and his wife, Natasha Barron, of Standish, Maine, was notified. An autopsy is scheduled for today. Barron was wearing civilian clothing, and it appeared that his body had been in the canal for at least several days, Bratcher said. Barron was stationed at Marine Corps Air Station Yuma, where he was a Harrier jet mechanic. He lived off base. His roommate last saw Barron the evening of March 15, said Marine Captain Staci Reidinger. When Barron failed to show up for work on March 16, his commanding officer checked on him and found he was missing, and military investigators were called. Yuma police were notified two days later by his mother, said police spokesman Sergeant Clint Norred. A Fort Bragg-based solider has died in Djibouti in a noncombat related incident, according to the Army. Master Sgt. Jamal H. Bowers, 41, of Raleigh, was found dead Friday at Camp Lemonier, said spokesman Mark Schulz. Schulz said Bowers had been feeling ill the day before and had been sent home and the death appeared to be medical in nature. Bowers was a U.S. Marine who joined the Army in 1999 as a combat engineer. In 2001, he was qualified in psychological operations, and he had worked as an instructor at the psychological operations qualification course at the John F. Kennedy Special Warfare Center, Schulz said. FORT HOOD, Texas (KXAN) - Fort Hood officials found a 19-year-old soldier unresponsive in his barracks on Sunday. The cause of his death is unknown for now. Pfc. Tommy Lee Curd, from Ellington, Mo., joined the military February 2010 and worked as a vehicle mechanic. He was assigned to 509th Forward Support Company, 504th Special Troops Battalion, 504th Battlefield Surveillance Brigade, Fort Hood , since December 2010. Soldier Escapes William Beaumont Army Medical Center? Police called off the search for a soldier? The same soldier Army officials thought it was so important to get him to the medical center, they escorted him there? How much of this story makes sense? EL PASO, Texas -- A Fort Bliss soldier who was about to get treated for a medical condition at William Beaumont Army Medical Center runs away from his chain of command. El Paso police have called off their search, but the soldier is still missing. Police were called to the area near McKelligan Canyon and Alabama Street around 2:30 p.m. Tuesday to help search for a soldier who is accused of running from his chain of command. "It's kinda scary. There was a brown car that was parked all crazy here," said northeast El Paso resident Erika Porras. Porras saw the commotion in her neighborhood and she became worried. Fort Bliss officials said Army officials were escorting the soldier to a doctor's appointment at William Beaumont Army Medical Center. "He was escorted by a unit leader because we care and want to ensure our soldiers make their medical appointments," said Mayor Myles Caggins, the spokesperson for Fort Bliss. "They teach us how to get over there," he said. "Now they need to teach us how to get back." MINOT, ND -- At 8:20 p.m. on Sept. 21, 2010, Iraq veteran Brock Savelkoul decided it was time to die. 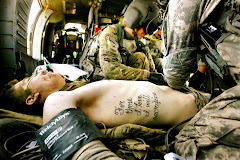 by T. Christian Miller, ProPublica, and Daniel Zwerdling, NPR March 22, 2011, 1:05 p.m.
MINOT, ND -- At 8:20 p.m. on Sept. 21, 2010, Iraq veteran Brock Savelkoul decided it was time to die. He lurched from his black Tacoma pickup truck, gripping a 9-mm pistol. In front of him, a half dozen law enforcement officers crouched behind patrol cars with their weapons drawn. They had surrounded him on a muddy red road after an hour-long chase that reached speeds of 105 miles per hour. 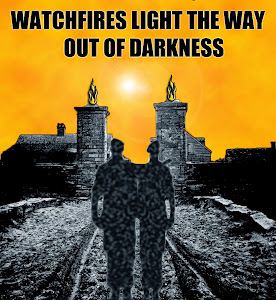 Savelkoul stared at the ring of men and women before ducking into the cab of his truck. He cranked up the radio. A country song about whiskey and cigarettes wafted out across an endless sprawl of North Dakota farmland, stubbled from the recent harvest. Sleet was falling, chilling the air. Savelkoul, 29, walked slowly toward the officers. He gestured wildly with his gun. "Go ahead, shoot me! ... Please, shoot me," he yelled, his face illuminated in a chiaroscuro of blazing spotlights and the deepening darkness. "Do it. Pull it. Do I have to point my gun at you to ... do it?" Twenty feet away, the officers shifted nervously. Some placed their fingers on the triggers of their shotguns and took aim at Savelkoul's chest. They were exhausted, on edge after the chase and long standoff. They knew only the sketchiest of details about the man in front of them, his blond hair short, his face twisted in grief and anger. Dispatchers had told them that Savelkoul had been diagnosed with post-traumatic stress disorder. They warned that he might have been drinking. Family members told police that Savelkoul had fled his home with six weapons, including a semiautomatic assault rifle and several hundred rounds of hollow point ammunition. To Megan Christopher, a trooper with the North Dakota Highway Patrol, Savelkoul's intentions seemed obvious. "Suicide by cop," she thought. "He wants to go out in a blaze of glory." As it happened, Savelkoul's state of mind was of interest not only to the cops, but to some of the nation's top military officers and medical researchers. More than 2 million troops have deployed to Iraq and Afghanistan since 2001. Tens of thousands have returned with a bedeviling mix of psychological and cognitive problems. For decades, doctors have recognized that soldiers can suffer lasting wounds from the sheer terror of combat, a condition referred to today as post-traumatic stress disorder. They also have come to know that blows to the head from roadside bombs -- the signature weapon in Iraq and Afghanistan -- can result in mild traumatic injuries to the brain, or concussions, that can leave soldiers unable to remember, to follow orders, to think normally. Now it is becoming clear that soldiers like Savelkoul are coming home afflicted with both conditions, in numbers never seen before. Studies have estimated that about 20 percent of soldiers returning from Iraq and Afghanistan have suffered a mild traumatic brain injury while deployed. Of those, anywhere between 5 percent to nearly 50 percent may suffer both PTSD and lingering problems from traumatic brain injuries. It is an epidemic so new that doctors aren't even sure what to call it, let alone how best to diagnose and treat it. Savelkoul and four of his comrades landed on the front lines of this confounding new conflict over the minds of America's soldiers when an Iraqi rocket exploded near their trailer in January 2009. By chance, a senior Army neuropsychologist was in Iraq at the time to conduct a study on the military's tools for diagnosing concussions. After learning of the attack, he persuaded Savelkoul and the others to enroll. The men became the first fully documented victims of "pure blast" concussions -- that is, mild traumatic brain injuries caused by the force of an explosion, rather than a secondary effect, such as slamming into a Humvee wall after a roadside bomb. EVANSVILLE — Those engine-revving, leather-clad bikers, who began aiding military families in 2006, for the first time are profiled in a film. More than 400 people came to see its sold-out premiere on Evansville's East Side on Sunday afternoon. "These guys are true patriots," said former Congressman Brad Ellsworth, who attended the premiere of the documentary "Patriot Guard Riders" at Showplace Cinemas. "Some are vets and some aren't, and no matter the weather, they show their patriotism and respect for our troops." 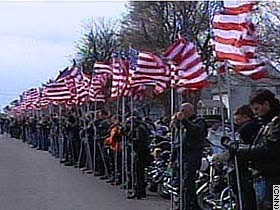 The group Patriot Guard Riders began in 2006 when a few American Legion riders in Kansas coalesced in response to protests by the Westboro Baptist Church, whose members believe that soldiers' deaths are God's way of punishing America for tolerating homosexuality. Since then, the Patriot Guard Riders group has grown to nearly 250,000 members nationally, with about 250 in the Tri-State. Families that have had the Patriot Guard Riders as part of their cortege during their military funerals have often thanked and commended them. In the film, a top Westboro member shared her thoughts. "The first time I saw them ... was in Chelsea, Oklahoma," said Shirley Phelps, a member of the controversial Kansas group that often protests at military funerals, in the documentary. "And no joke: They started revving those engines, and the earth shook." If this means nothing to you then please make sure you work through Memorial Day Weekend. No cookouts, parties or parades and whatever you do, do not go to a cemetery where the dead are honored. When July 4th comes, don't hang out a flag since you must not care how we ended up the "land of the free and the home of the brave." The Bill of Rights and the Constitution would have been nothing more than words on paper had it not been for the Patriots risking their lives to deliver on what the Founding Fathers wrote down. 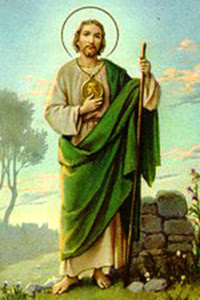 You should avoid any celebration of this day as well since you must not care about the price paid for it. When Veterans Day comes just keep going about your regular business looking for sales so you can save some money, giving no pause to the men and women who risked their lives for your sake. If you are a politician and this means nothing to do then don't show up to say how much you care when clearly, you haven't cared enough. While you may worry about votes against you and the death of your political career, they worry about their lives and the death of friends. They put their trust in you when you voted to send them into combat and you abandoned them. It is as simple as that. Eight years ago this week the first Marine died in the war in Iraq. James, a private, grew up in a small town in western Pennsylvania and enlisted in the Marine Corps straight out of high school. He was assigned to an infantry unit and sent to northern Kuwait to take part in the invasion of Iraq. Feeling depressed and overwhelmed, he walked into a plastic porta-john at the edge of base camp, chambered a single round in his M16, and shot himself in the head. He was 19 years old. I never met James and I didn't know him. But we served in the same battalion of light armored vehicles and I was thirty yards away from that porta-john. I remember hearing the shrill crack of a single rifle shot and I remember seeing his blood gush from beneath the door of the porta-john, forming a dark crimson pool in the Kuwaiti sand. War is ugly and harsh and painful. 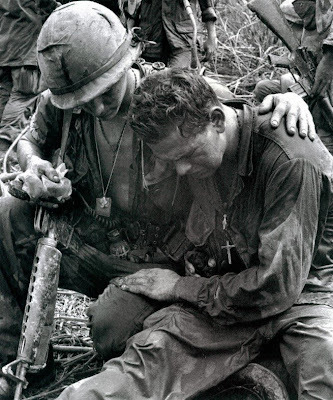 War stories, especially the true ones, should remind us of the terrible toll that war inflicts on young men and women. Today there are no monuments to James, no scholarships in his honor, no schools named after him. He died in Iraq but he didn't die in combat. We, as a nation, don't really know how to deal with the increasing numbers of veterans who struggle with the invisible wounds of war - post traumatic stress disorder, major depression, and traumatic brain injury. 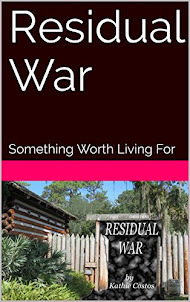 The terrible reality, of course, is that war rages on for the veteran long after he or she has come home. The statistics are sobering. 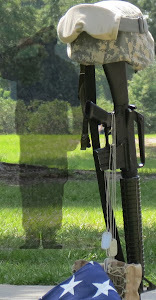 The military lost more troops to suicide in 2009 and 2010 than it has lost to combat in Iraq and Afghanistan. At the country's largest Army base, Fort Hood in Texas, 22 soldiers committed suicide in 2010. And a recent study found that female veterans commit suicide at three times the rate of young women who have not served in the military. These young men and women are not cowards. They served their country with honor and distinction. They and their families made enormous sacrifices. And the struggles faced by today's generation of young veterans are no different than the challenges faced by veterans of previous wars. Readers of the bestselling new book Unbroken, for example, will recognize the terrible symptoms of post-traumatic stress disorder that Louis Zamperini struggled with after coming home from World War II. The Department of Veterans Affairs reports that more than 6,000 veterans commit suicide every year. That is an average of 18 veterans every day. The vast majority of these suicides are committed by older veterans who served in World War II, Korea, Vietnam, and the Gulf War. There is a sickening disconnect in this country. No one seems to care about the two million veterans Afghanistan and Iraq have created any more than they care about the other 22 million or so more already neglected. All the talk right now in about Libya but news reports from Iraq and Afghanistan ended when the American people didn't want to watch them. The interest in Libya will die off soon enough and they can all go back to paying attention to Charley Sheen while few pay attention to who is a lot more important to the future of this nation just as they were to her past. The eye opening fact is that no matter how much we ignore them, no matter what their service has put them through, they would do it all over again for thankless people celebrating a weekend off. David Brash had enough to worry about while deployed overseas. The last thing he should have had to worry about was his mortgage considering he set up automatic payments. The problem is no matter what he did right, someone did something wrong, leaving him to have to worry about his credit being destroyed. You'd think Coldwell Banker would have wanted to do the right thing, especially for a deployed soldier, but they were not interested according to this report, even when he called from overseas to get things cleared up. The cool thing on this is the jury was aggravated over how he was treated and acted on it. A federal jury awarded a Fort Benning Soldier more than $20 million on Monday in a case against Coldwell Banker Mortgage -- an amount the plaintiff's attorney called necessary to get the company's attention. Jurors in the case of David Brash v. PHH Mortgage Corp., doing business as Coldwell Banker, deliberated for about six hours before ruling in Brash's favor. During the six-day trial, jurors heard that Coldwell Banker improperly reported Brash, 29, to credit bureaus which led to a "serious delinquency" on his credit report, that it refused to answer his questions or correct his account and damaged him emotionally, physically and financially, his attorneys and court documents say. "The jury was aggravated as to how he was treated," said Charlie Gower, an attorney who represents Brash. "I think the jury was just very mad because they were attacking David Brash the Soldier and basically calling him a liar." Jurors heard recordings of calls Brash made, recorded by PHH Mortgage, in which Brash would be on hold for 30 or 40 minutes at a time with overseas customer service representatives, said Gower and Teresa Thomas Abell, another attorney representing Brash.